2013 CDA Big Book of Savings…now available! We have just released our CDA/2nd Quarter Big Book of Savings in pdf format for FREE download. This year’s book is packed with some great savings and specials from our manufacturer partners. Some of the specials are only good at the CDA, but many run through June 30, 2013. Don’t miss the special coupons on the back cover! The fine folks at KaVo Dental have put out a great piece (pdf) called “10 Things to Remember About Handpiece Maintenance” and is available as a free download. We suggest that you download it and keep it in your sterilization area for your staff to reference. As always, if you have any questions regarding handpiece maintenance or repair, please give us a call at 800-482-5539 x 107 and we can answer any questions you may have. As we start off 2013, we wanted to highlight our Quala brand of products, along with some new products that caught our attention that we feel you should know about. As always, it’s never too early to start thinking about equipment purchases, whether it be upgrading your existing office or adding a new component such as digital radiography. Our knowledgeable staff is here to help answer any questions you might have. Click here to download our First Quarter Flyer. As part of the Affordable Healthcare Act (Obamacare) that was signed in 2010, the Medical Device Excise Tax will take effect on January 1, 2013. The 2.3% excise tax will be collected and reported by the manufacturers of the devices. The word “device” is misleading as to what items will actually qualify for the tax. The provisions of the excise tax on medical devices rely almost entirely on the definition of medical devices provided by Section 201(h) of the Federal Food, Drug, & Cosmetic Act to determine which devices are taxable. The tax will apply to devices that are intended for human use and will include dental instruments, dental equipment, and research-use-only devices. After doing some research on the matter, it seems that just about everything that you use in your dental office, will fall under this tax…burs, composites, impression material, bonding agents, etc…you get the point. We have been getting letters from just about every dental manufacturer over the last few weeks stating that they will be instituting a 2.3% price increase on January 1, 2013 to cover the excise tax. Many have also informed us of their annual price increase as well, in some cases we are looking at increases of 4-7%. 1. If you are planning to upgrade your existing equipment, add digital sensors, etc., consider getting it put into service before December 31, 2012. Not only will you avoid the 2.3% tax, you will be able to take advantage of Section 179’s increased allowances for 2012. To take advantage of this deduction, your Section 179 Qualified Financing and your equipment must be in place on or before December 31, 2012. Section 179 Deduction limit after adjustment for inflation has increased to $139,000 (maximum allowance would have been only $25,000 prior to the new legislation). Section 179 Threshold for total of equipment & software that can be purchased has increased to $560,000 (threshold would have been only $200,000 prior to the new legislation). 2. 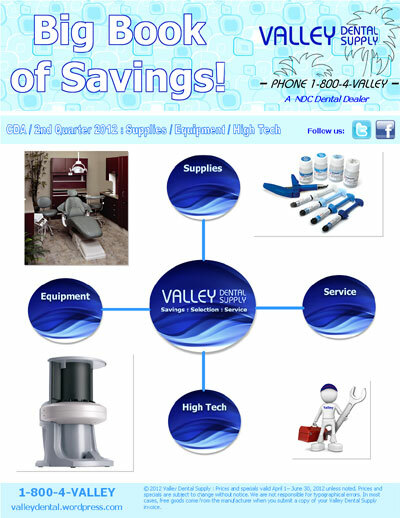 Stock up on your dental supplies before the end of the year. You will not only save paying the tax, but you will get those items at 2012 prices. That is a 4-7% savings…you wont make that on your money sitting in the bank. We are suggesting 3-6 months worth, depending on your finances and storage space. We suggest you consult your tax professional regarding Section 179. This week, leading executives from a broad coalition of medical technology companies, physician groups, venture capital firms and leading associations submitted a letter to Senate leadership urging policymakers to repeal the onerous medical device tax that threatens U.S. jobs, medical innovation and patient care. It’s that time of year again and we are gearing up for the California Dental Association Spring Session in Anaheim, Ca. This year’s Big Book of Savings is packed with some great specials from many of the manufacturers we represent. Some of specials are only available at the show, so you can always pre-order and your Valley representative can place the order for you at the show. Stop by booth #1386 and say Hi. This year’s CDA Big Book of Savings is available for download. 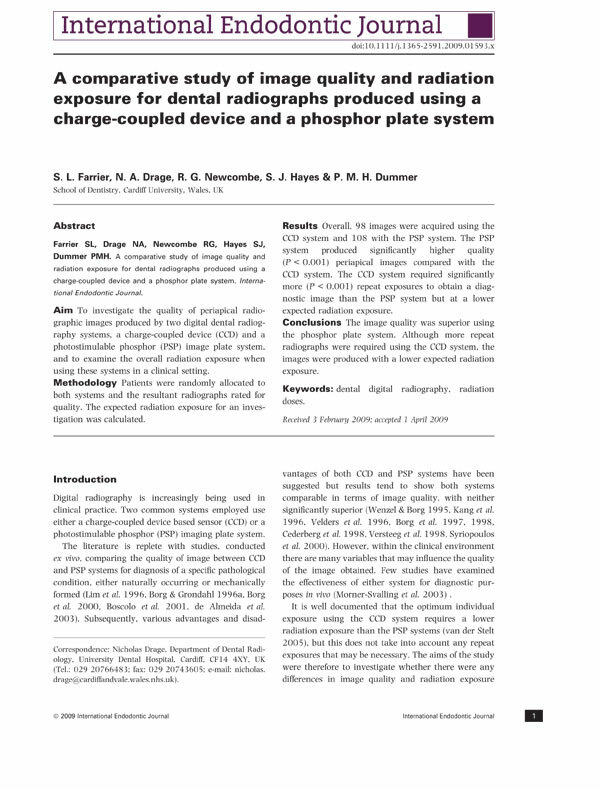 exposure for dental radiographs produced using a charge-coupled device(digital sensors) and a phosphor plate system. You can download the study(Adobe pdf) here. It’s time to start thinking about year-end tax savings. Earlier this year, The HIRE Act for 2010 was enacted. This allows a practice to expenses up to $250,000 of qualified equipment and software purchases. Here is a good site loaded with lots of information about Section 179. Equipment must be in service by December 31,2010. If you are looking to upgrade your current equipment or are looking to get into digital x-rays, give us a call, we can help.